History: The Guernsey County Courthouse was built in the year of 1881. In the years since the courthouse has been built, there have been many changes. The largest change, which affected everyone who is employed here and the general public, went into effect August 1, 2016. The entry doors went from five to one. The security entrance is located on the first floor, east side. 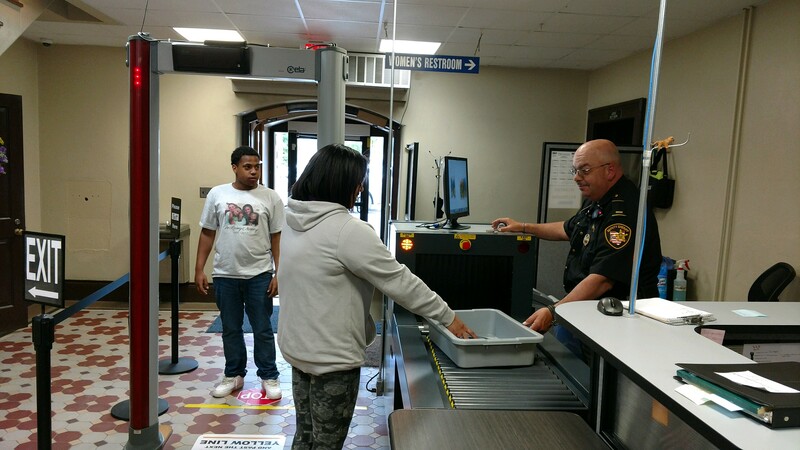 Upon entering the courthouse, everyone will be searched at the security station which is manned by a Guernsey County Deputy. The general public will be searched along with their belongings. Each person walks through a metal detector and belongings will be x-rayed for contraband items. There will be no guns, knives or any personal defense weapons allowed past the security station. The main door opens at 8:00 a.m. with all offices opening at 8:30 a.m. and we are open five days a week. All offices and doors close and lock at 4:00 p.m. at the end of the workday. The courthouse is home to the Guernsey County Court of Common Pleas, Adult Probation, Juvenile Court, Juvenile Probation, Probate Court and the office of Clerk of Courts.